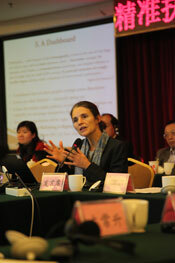 The International Poverty Reduction Center of China (IPRCC) hosted a two-day International Workshop on Accurate Poverty Alleviation and Multidimensional Poverty Measurement on 27-28 March 2014, in Beijing, China. 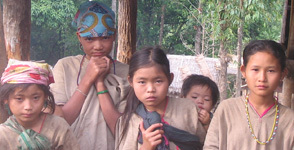 China is a member of the Multidimensional Poverty Peer Network (MPPN). The workshop was opened by Zheng Wenkai, Deputy Director General of the State Council Leading Group Office of Poverty Alleviation and Development of China, and Dr. Zuo Changsheng, Director General of the IPRCC. The keynote speech was given by Sabina Alkire (left), Director of OPHI. MPPN members from Colombia, Mexico and Minas Gerais (Brazil) shared their experiences of how the Multidimensional Poverty Index (MPI) works as a measurement, policymaking and targeting tool. The workshop brought together representatives of Chinese regional and national government bodies. The workshop built on the work of the IPRCC with OPHI over the last years in developing an MPI methodology for use in China. China also shared its experiences and lessons learned in its application of the Alkire Foster method. The workshop also explored the operationalisation of the newly formed China Latin America Poverty Reduction Network.